Last year around this time, I read a Christmas book by Donna VanLiere called THE CHRISTMAS SECRET and I really enjoyed it. You can read my review here. Mrs. VanLiere has written numerous Christmas stories that touch readers' hearts, so when I heard she had a new book out this year, I jumped at the chance to read it. THE CHRISTMAS JOURNEY is a rather different from Ms. VanLiere's other books; however, I enjoyed it just as much. 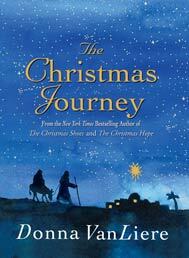 THE CHRISTMAS JOURNEY is actually an illustrated re-telling of the Nativity Story. While most of us are familiar with the story, Ms. VanLiere explains her reason for wanting to tell the story in her own words. Several years ago, she wrote this story for a church Christmas banquet as a reminder of the amazing journey that Mary and Joseph made. Ms. VanLiere is concerned that all to often we have "colored in or forgotten much of what happened to make that journey possible." I found this book to be a beautiful reminder of the the Nativity story, and I intend to share it with my entire family. The book begins with some verses from Luke 2 which give the biblical account of the birth of Jesus. Then, the story is retold in Ms. VanLiere's own words. She brings to life just how difficult Mary and Joseph's journey was. And she really demonstrates just how scared (and very courageous) these individuals were. In addition to the story, THE CHRISTMAS JOURNEY also has many beautiful illustrations by Michael Storrings. The watercolor pictures are simple, yet elegant, and perfectly reflect the tone of this story. While I appreciate the illustrations, I also like them because they give the younger children something to look at while reading the book. I found THE CHRISTMAS JOURNEY to be a beautiful book on so many different levels. All too often, I get caught up in the craziness of the Christmas season and forget about what it really means to me. THE CHRISTMAS JOURNEY is a terrific way for my family (and especially me!) to take some time and reflect on the wonder of the season. I highly recommend this book for grownups and children alike. Thanks to The Book Report Network for sending me a copy of this novel. Giveaway alert: I have a copy of THE CHRISTMAS JOURNEY to share with one lucky reader. To enter, just fill out the form below before December 12th at 11:59 p.m. ET. I will randomly select and notify the winner the following day. Contest is open to those of you with U.S. and Canada mailing addresses only. Good luck! This sounds like a keeper - I imagine you'll be pulling it out every Christmas for years to come. What a wonderful way to celebrate Christmas. I'm always thankful for reminders of what is really important over the holiday. I can't wait to read this. Oh, this looks like a wonderful book to share with my family. Thank you for the review, and the contest! I think its wonderful that Donna VanLiere wrote an illustrated version of the Nativity story. It's so easy to get caught up in the materialistic part of the holiday season and forget the spirit of it: kindness, joy, love, family and friends. And illustrating the story sounds like another great way to remind us of what this season is about. Thank you so much for offering a giveaway of this book, too! Sounds like a wonderful story for the season. Thanks for the opportunity to win it. I'd love to read this book. Too often we forget the REAL meaning behind Christmas! This sounds like a great one to read every year.